The 2019 edition of the National Board document NB-57, The National Board & ASME Guide, is now available and can be accessed for free on the National Board website located within the Resources box on the home page. This document describes the process for the issuance of the ASME Certificate of Authorization granting the use of the ASME Certification Mark issued by the American Society of Mechanical Engineers, and Certificate of Authorization granting the use of the Repair stamps (R or NR) issued by The National Board of Boiler and Pressure Vessel Inspectors. 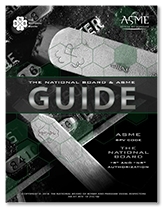 The National Board & ASME Guide was developed primarily for use by organizations making application under an ASME or National Board certification or accreditation program, ASME staff, National Board staff, and individuals participating on teams performing reviews of an applicant’s Quality Management System (QMS). This guide may also be useful for National Board Commissioned Inspectors and industry personnel associated with ASME Code construction and/or NBIC repairs and alterations, as required by the ASME Boiler and Pressure Vessel Code Certificate of Authorization Program, the National Board R Stamp Certificate of Authorization Program, and The National Board NR Stamp Certificate of Authorization Program.